Gate screens are a great way to make learners pause and interact with your course before continuing through it. 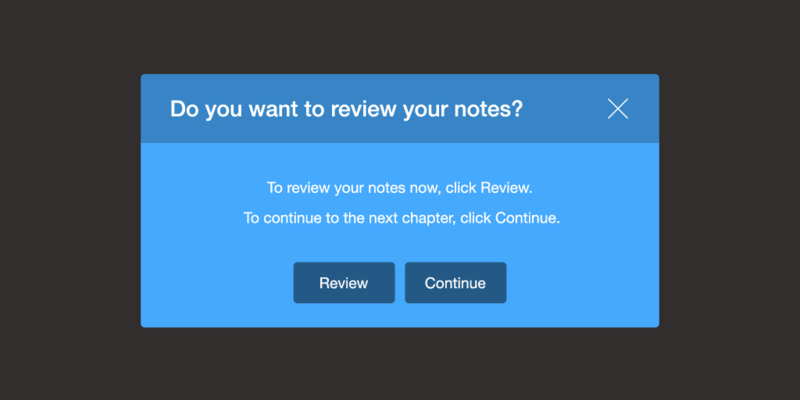 Think of gates like floating dialog boxes that provide a big picture overview or contextual help for a specific slide. Some typical uses for gate screens are general instructions, navigation and course player tips. They can also be used to provide compliance agreements, course checklists, and custom sitemaps for your course. Objective: Design a two-slide interaction that includes a content screen and a gate screen. The content screen can be a placeholder screen. The key is to show how your gate screen will load and close in relation to the course. Tools: You can use Articulate Storyline or PowerPoint to create your example. Resources: Check out Tom’s post on gate screens and the free Storyline and PowerPoint templates he put together in our downloads section. Forums: Create your own thread in our forums and share a link to your published source file. You can also attach your project files if you’d like some help or feedback. Personal blog: Post your published example on your own blog and include a link in the comments below. Heather Steckley kicked off the challenge with a roadmap theme and followed up with an out-of-the-box pseudo-scrolling tabs demo. Tricia Ransom shared creative example featuring interactive cabinet drawers with open and closed states. Kevin Thorn shared an elegant tabs example with animated tabs. Be sure to grab the free template he shared with his example. Przemysław Hubisz shared two grid-based tabs examples: version 1 and version 2. Montse Anderson first shared an leadership scenario followed by an interactive quotes demo. Andrzej Rudnik shared a wonderful photo slideshow tabs interaction. Jenise Cook shared a desktop-themed tabs interaction. To help you get started creating your own tabs interaction, Jenise shared her Storyline file and recorded a screencast. Thanks, Jenise! Have a gatetastic week, E-Learning Heroes! Simple gate idea using slide layers: Elearning gate screen The gate layer appears when the timeline ends and offers a chance to review resources, discuss the module, or continue to the next module. Here's my example: http://bit.ly/153tsWc Fairly simple design using the Solar System. Uses triggers, states, variables, and lightbox assets. @Tracy - that looks great. Is that space project something you're working on? Looks fun! Hey Lucia that looks really great! Really liking the examples you all are sharing in this challenge! Ribbons! Great twist on the standard modal boxes, Blair. Hey Joe that's both creative and hilarious. Admittedly, the first thing I did was click Exit just to see what was in store for Snuffy. Great example! I agree with David, Lesley - you've created a good way to make the learner stop and reflect for a moment. Very nice! I think we can all relate to wanting more time to play with the software. The challenges are always open, so jump into them when you can. Find the ones that appeal to you or get you out of your comfort zone. You're sharing some really great ideas so if there's anything we can do to help, please let us know! Hey Daniel - Cool idea for a gate screen. I updated the recap to include your gate screen. Thanks!